Trips: Bus Sovicille - Siena (14 times from Monday to Saturday; 4 times on Sunday. 7 minutes by feet from our house to bus stop. But for trips in the area around Sovicille (Montagnola Senese; Chianti, etc.) you need an own vehicle, bicycle or car. Many guides in different languages in the house. I'am coming originally from Germany, but I live in Italy since 1976. My wife Anna and me are married sind 1979 und we have two children, who actually study at University. We bought this house, because it was our dream: 20 years we lived in the village of Sovicille and this house was our dream: it was the best situated house of Sovicille (alone on the hill, but also near the village with all comforts) and at the same time an old house with a history, which is rooted deep in the middle ages. We have bought this old house, where the plants grew into the cracks of the walls, in 1999, and we restored it completely with traditional materials and new (bio-) technics. The columns of the 12th century, the absolute peace of the wood, the meadow behind the house with birds, deers, sqirrels etc., which we can see: simply an idyll, in the summertime, in spring, in autumn and also in the winter. In the summertime also the pool does his contribute to relax and refresh. Outside pool: 9,10 m x 4,60 m, depth 1.32 m; 50m3 water; some degree heated by solar panels Poolseason (=price inclusive pool): 2017: 09.06 - 22.09. 2018: 09.06 - 21.09. 2019: 01.06 - 20.09. The typical Tuscany yellow reddish gravel around the house and at the terrace sites is stabilized by a special processing and solidified, so that he dusted at all and even in the rain no annoying dirt arises. Hammocks between the trees are located and the large trees also offer in the summer heat, a superbly cool shade. The ventilated Korkisolation the roof increases the insulation capacity in summer and in winter by 30% compared to conventional insulation materials. Children have much free run on the large plot of land available. Toys available. Landline telephone, broadband internet access for free. Pool exclusively for tenants from22nd June to 30th August (included in price). Outside of the pool season on demandand a price of 240 euro per week. A family group of 9 adults, we were in occupation for two weeks. We were utterly charmed with the house, its setting and the location, which was perfect for our multiple needs. Being within walking distance of the town centre of Sovicille, with its shops, restaurant and bars, plus, significantly. its wonderful public transport access to Siena was an enormous benefit. We loved exploring the house and its garden, watching the wildlife, revelling in the views, and then exploring the area. Siena was the ideal centre for activities, and we didn't even bother visiting Florence in the end. Owner Bernhard and his niece Clara, who cares for the house, now feel like friends whom we would like to meet up with. They looked after us really well. Thank you so much for our wonderful holiday! This place was as described - rustic old villa in a lovely setting. The pool was great and kept the kids amused for many hours. Plenty of space in the house itself, and a good range of bedrooms and bathrooms. 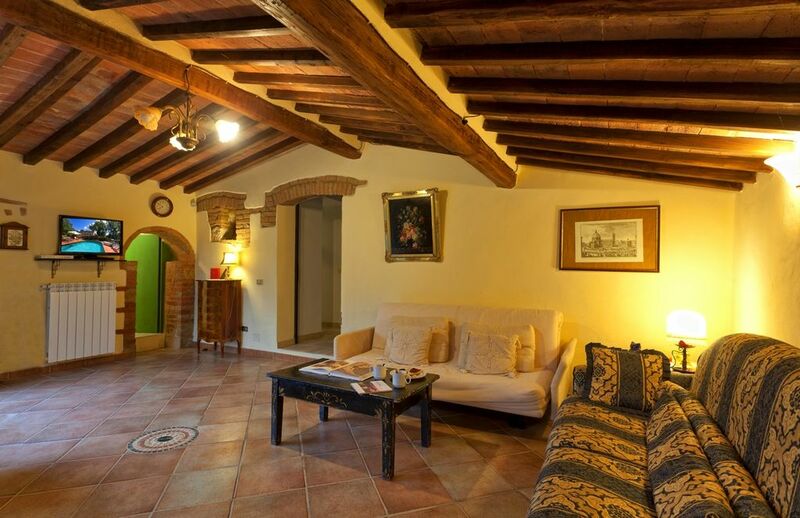 We used the house as a base for visits to Siena, Florence and other towns nearby. The nearest big supermarket was only a few minutes drive away and had everything we needed. The local restaurant was good for eating in, as well as take away pizzas. Everyone really enjoyed their stay. My family of 11 had a magnificent time in Tuscany. Helene prepared a wonderful Italian dinner on one night of our stay and was the first to greet us when we arrived. The house was located where we could easily drive to and enjoy many of the Tuscany towns like Montereggioni, Siena, and Florence. Thanks also to Angelika and Clara, who were also available at times to answer any questions we might have had about the house or area. Beautiful villa , gardens and pool. Spacious comfortable facilities. Warm helpful hosts. We were impressed with the kind and helpful welcome from the owners. And we loved the space and facilities in the beautiful villa. The pool and gardens are secluded and so relaxing...and the whole area is peaceful and restorative. We cannot recommend it too highly. When my two daughters asked me how I wanted to celebrate my 80th birthday I chose to rent a villa somewhere in Tuscany for three weeks. We could not have made a better choice than the Antico Podere Il Sole Rota in Sovicille. The restored farmhouse has six bedrooms and four baths and easily accommodated the 10 members of the family and close friends who joined us for various lengths of time over the three weeks. Sovicille is conveniently located in the Siena area and we made many trips to nearby medieval villages, plus special outings to Siena, Assisi, and Florence. Members of our host's family live nearby and were quick to respond when we had questions, needed translations to Italian in order to make reservations, and on two occasions to come in to prepare a wonderful meal! Many of our group are avid walkers and made numerous trips into the village of Sovicille and walked for miles around the area. You do need at least one car but there is reliable bus service into Siena and train service from there to Florence was great! The kitchen is well-equipped and the Internet connection works just fine. Not much English TV available but nobody missed it! I personally spent many hours just sitting in the beautiful yard overlooking the pool and gorgeous wooded scene. The weather was ideal - 70's and gorgeous sunshine almost every day in September leading into October. I sincerely hope to return to Podere Rota someday and was very sad to leave on the final day. Nous somme partis à 2 familles de 5 personnes, soit 10 personnes, la, maison est suffisament grande par nous accueillir. Quand nous sommes arrivés nous avons été accueillis par Clara, la niece du propriétaire, qui nous a bien aidé par ses conseils et sa disponibilité. La maison est très agréable, beaucoup de calme, beaucoup d'espace intérieur et extérieur, nous avons également profité de la piscine ( indispensable pour se rafraîchir au mois d'août quand il fait 40º). Deux petits problèmes pendant notre sejour : chaudières en panne ( mais grace à Clara, le problème a rapidement été réglé), un jour à cause de la forte chaleur, la piscine a tourné ( et encore une fois Clara est venu en urgence pour régler le problème). En conclusion, nous étions vraiment ravi de ses vacances !! C'était super! Je recommande. Autre plus : on a apprécié les moustiquaires a chaque fenêtre et le barbecue en dur. MERCI ENCORE A CLARA POUR SA DISPONIBILITE! The house is set at the border of the wildlife reserve of the 'Montagnola Senese' a hilly area that is characterized by beautiful holm oak woods and is famous for its castles, farm estates and countless Romanesque parish churches. The area, which is full of paths, is ideal for those who love going for walks and trekking. - Special events: July 2 and August 16 the world-famous Palio of Siena! You can reach Siena easily by bus from Sovicille (look at Wikipedia). Wir vermieten wochenweise, zwischen Anfang Juni und Ende September nur von Samstag auf Samstag. Die Preise enthalten die Poolbenutzung nur für die Hochsaison vom 9. Juni bis 21. September 2018, und vom 1. Juni bis 20. September 2019. Für den Pool außerhalb der Poolsaison berechnen wir 350 Euro pro Einzelwoche, 200 Euro pro Woche bei 2 Wochen oder bei 'Anschlußwoche', d.h. wenn in der Zeit vorher oder nachher der Pool in Betrieb ist. PREISNACHLASS Die Gemeinde Sovicille erhebt eine 'Tourist Tax' in Höhe von 1,50 Euro pro Tag und Person bis zu 6 Übernachtungen, die in unseren Preisen enthalten ist. Das wären 9 Euro pro Person. Keinerlei Taxe braucht bezahlt werden für Kinder bis zu 12 Jahren sowie alle Personen, die mehr als 11 Nächte bleiben. Da also ab 12 Übernachtungen keinerlei 'Tourist Tax' gezahlt werden brauch, geben wir ab 12 Übernachtungen einen Nachlass von 9 Euro pro Person älter als 12 Jahre. Wir haben eine Erdgas Zentralheizung. Eventuelle Heizungskosten werden zum Selbstkostenpreis extra abgerechnet.